Have you ever watched a movie or TV show, saw a clothing item and gasped, "I have to have that?" You're not alone. And if it's a hand-crafted item in a nerd-friendly show, chances are good that someone has created a pattern or a how-to so you can replicate it on your own. My humble effort. Pretty cunning, don't you think? All of these, ah, interpretations of a hat design lead me to conclude that this was Ma Cobb's first hat. Not only was it her first hat, but she designed it herself. I deduce this because, if she used a pattern, the pattern designer probably would not have incorporated the ... choices ... Ma Cobb made. ... Therefore, it is my contention that Ma Cobb designed and knit her very first hat — to mail across the galaxy to her boy Jayne. A mother's love, my friends. In addition, Jayne immediately put on and wore the hat — as jarring as it may have been to his tough-guy image — which speaks volumes about Jayne's own love for his Mama (even without the letter that tells us Jayne sends money home for his sick sister). I find their love heartbreakingly sweet. Honestly, knitting a pattern from a show that I love, created by a fan who can bring such empathy to a brief scene like that? How does it get any better? 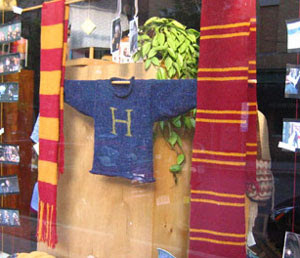 While the Jayne hat may be popular, the Harry Potter film franchise has also moved knitters and other crafters to recreate the handmade scarves, hats and sweaters onscreen. You'll find scads of Potter patterns inspired by the movies' clothes and accessories at The Leaky Cauldron. Again, many of these were created by knitters who watched the scenes over and over, reverse-engineering what they saw. Photo from The Blue Blog. Non-knitters can also get in on the action. For example, here's a tutorial on how to make shockingly accurate recreations of the little fellas from the movie 9. What handmade items from film and television do you covet? And have you ever tried to recreate on onscreen look for yourself? Bella's knitted hat from the beach at La Push is a big handmade item. I've never seen the appeal of that one myself, I think it's particularly plain, but I see patterns for it EVERYWHERE. I've been eyeing one pattern for the shawl Mary Poppins wears in her interview scene with George Banks. I'm determined to have it. Oooh, I forgot about Twilight. Bella's mittens from the first movie were huge, too. Every photo of the finished objects included an apple, it seems like. I'M GETTING A JAYNE HAT?!?!?!? 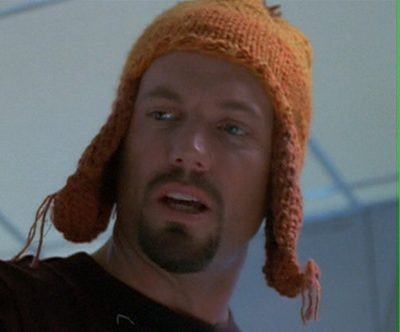 I was knitting for years before I made my Jayne hat but during a rewatching of Firefly, I decided that it would be my present for me. Every now and then, I like to wear it as a sign of rebellion.